Washing machine numbering is those electrical appliances which we use very much in our homes. Today we disuse washing machine not spinning problems and how to fix and repair these problems. In this post we will lighting about these problems and it's faxing methods. 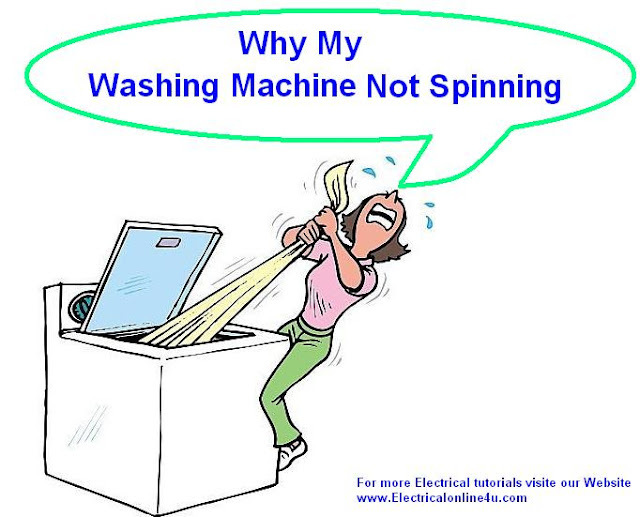 There are many problems of washing machine not spinning which we can face in our new or old washing machine, As we told you in above sentences that in this post we are lighting some tips about washer not spinning. In Below i highlight some reasons but IN SHA ALLAH we will make more helpful tutorials further on this site. How to test voltage by multimeter? Test you machine wire, the wire means to test the supply wire or shoe and if you find out any bad things then change it. However you can also test wire using multi meter on connectivity test mode or Searing testing board. Also test the socket / outlet where you enter your machine shoe. How to make a series testing board? Tow way switch and timer switch is also a big reason of washer not spinning, in this case your motor will not start or not energize, but there are many other reasons of motor not staring. For this situation open the wiring point and check your both switches. The main and working things in washing machine is electric motor because all work can be done by only electric motor. Test your electric motor using ohm meter, and also remove the belt and then move the motor with your own force, if the motor is free and shaft is move easily then it's means the motor bearings is good state and if it's not free moving or make some noise then change the motor bearings. If motor have fault then check on electricity with no load. If your washing machine not spinning due to capacitor capacitor is not doing his duty properly, as we know that a single phase motor required a capacitor to start up. And if capacitor not working then motor will not start and it's also a problem of not spinning. Also if your capacitor is weak then you will also face this problem, but this will better for you to change it with same number (uf) of capacitor. Mostly this problem washing machine not spinning did not face us, however some time washing machine stop spinning due to belt slipping, in this case machine can spin the washer with out clothes. For check i want to gave you example, e.g for example your top loading washing machine washer spin but with out clothes. For this start you washing machine on two way mode. When the W machine complete his on cycle, it's will stop for a few second then force on your hand on outer wash plate using your hand. Then if motor start, but not taking any force to spin the outer wash plate. It's means that your motor belt was slipped. For fixing this type of machine, change the belt with same size or number as other was. One for the big reason of washing machine not spinning due to shaft jam, in this situation, first of all remove the belt of motor and then spin the outer wash plate using your hand. If the washer required a big force or totally jam then your washing machine shaft was jammed and you must change it with new one. In some type of washing machine have a water control switch which working with water level and design for measuring the water in machine. If your above all things is all right, as yet washer not spinning then also take a look on this switch if your washing machine have and fix it. I was worried about my fax machine because the problem is my fax machine is leaving a line down my page! So, I think got the solution, I will share this information in studentwritingservices, Here are you find some hot tips to solve all the problems in everything you will need.